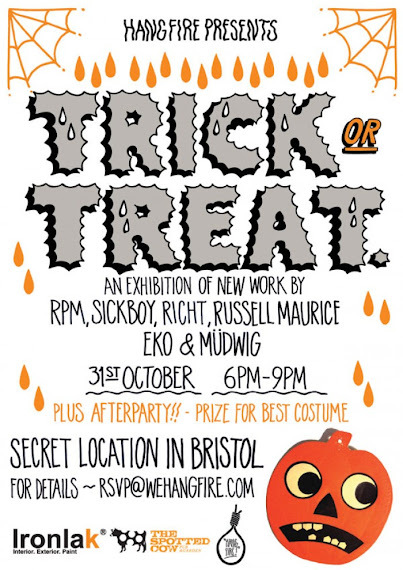 Coming to you this Halloween, Wednesday the 31st of October at a secret location in Bristol, “Trick or Treat” the exhibition. RSVP now for an invite to the Trick or Treat fun house. With prizes for best dressed punters. Bring your wallets and your friends. this ones gonna be a howler. With artwork from some of Bristols finest including RPM, Richt, Sickboy, Mudwig, Eko and Russell Maurice. 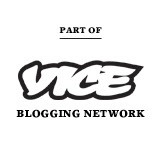 6-9pm plus an after party. It’s first come first severed. 60 new original pieces of artwork plus installations, games, tricks and treats for those who are lucky enough to be first in line. Eat, drink and be scary. Fresh spider cider and more. The location will be revealed to you via email the night before the show.